From the bestselling and award-winning team behind Roadworks, Demolition and Construction. Bleep, bleep. Emergency! News just through: Crash, crash, there's been a crash. Let's go, crew! Nee nar nee nar. 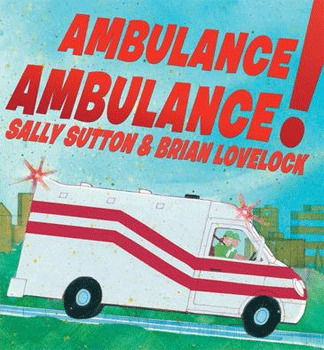 An exciting new collaboration from Sally Sutton and Brian Lovelock, bestselling and award-winning creators of Roadworks, Demolition and Construction. Sally Sutton is the award-winning and bestselling author of Roadworks, Demolition and Construction. In 2009 Roadworks won the Picture Book category of the New Zealand Post Children's Book Awards, and in 2015 Construction was a finalist. Ambulance, Ambulance! will be Sally's eighth picture book for WBA. Sally lives in Auckland, New Zealand, with her husband and two daughters. She has a keen interest in European languages and has an M.A. (Hons) in German. She also enjoys writing plays for the stage. Brian Lovelock is a scientist working in the power industry in New Zealand. He has painted all his life. His previous titles with Walker Books Australia include Your Mother Didn't Do That! and Roadworks which won the Picture Book category in the 2009 New Zealand Post Book Awards for Children & Young Adults. In 2013, Brian was long-listed for the CILIP Kate Greenaway Award for his work on Demolition. In 2014, Flight of the Honey Bee won the LIANZA Russell Clark Illustration Award, was a Storylines Notable Book and was a finalist for the LIANZA Elsie Locke Non-Fiction Award and the New Zealand Post Children's Book Awards.